Madame ‘X’ often jeered at us from the blackboard, never turning around as she heard the gasps of dismay, the predictable response to most of her threats. A sudden visitor to her French classroom would have caught our wide-eyed terror as an hour of unprepared dictation loomed through the murk of some imagined misbehavior. The stranger would have wondered about the cause of the effect. There was always a vortex of tension spinning in Madame ‘X’s class. She knew how to keep us hopping in a pressure cooker fueled by panic and embarrassment. Lucky to have survived many educational experiences like those French classes long ago, I often find myself seeking formal learning situations today, such as a lecture at the Frick Collection recently. 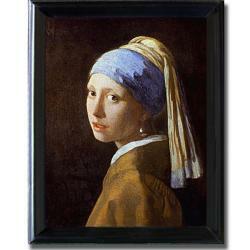 The subject was Vermeer’s famous painting, ‘The Girl with a Pearl Earring’, put in context by a curator from the Metropolitan Museum of Art. My first reaction to the painting was how different it seemed in person than reproduced in print. ‘The Girl’ looked a lot younger, a point the lecturer made immediately, as well. Next we went on to discuss how the painting was not, in fact, “just” a portrait. What made it “a work of art” instead was the responsiveness reflected in her body language and expression. There’s nothing static about her. You can feel a dynamic tension between the viewer/painter and the subject, and that’s because she’s responding to something that just happened in the room or with the painter, leading to much speculation about the story behind her reaction. That responsiveness and the dynamic tension it sets up reminds me of Itzhak Perlman’s counsel to his string instrument students to make a ‘constant response’ to the music, even if they’ve played it a million times. The response is necessary for the music to be alive, just as it’s necessary for the girl with a pearl earring to be real. I quickly saw the parallel to my writing, where responsiveness gives characters life and saves them from the static portraiture some novelists slip into, no matter how fluid their prose might be.